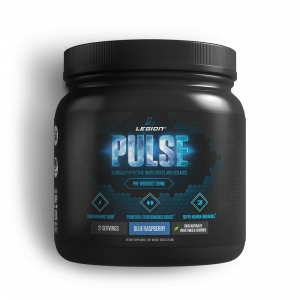 Legion Pulse vs. Pre JYM: Which Pre-Workout Is Better? If you want to know how Legion Pulse compares to Pre JYM in terms of ingredients, dosages, and effectiveness, then you want to read this article. Pre JYM contains a lot of ingredients and some make more sense than others. Pulse contains fewer ingredients, but all are included for good reason. While some of the ingredients in Pre JYM are at clinically effective levels, others aren’t. All ingredients in Pulse are at clinically effective levels. If you’re not worried about artificial chemicals and feel particularly drawn to Pre JYM for some reason, then it may be the better choice for you. If you want a 100% natural pre-workout supplement with scientifically proven ingredients and dosages and nothing else, then Pulse is right for you. Pre JYM is one of the most highly rated pre-workout supplements on the market today, and it’s no surprise why. It boasts a long list of active ingredients, it contains no proprietary blends, and its formulation appears to be backed by sound scientific research. It’s also quite similar to my pre-workout Pulse because both contain citrulline malate, betaine, and beta-alanine, so many people wonder how the two compare. Pre JYM’s formulation is better than many other pre-workouts on the market. It contains several high-quality ingredients at clinically effective levels and will likely enhance your physical performance and mental alertness. That said, Pre JYM also contains ingredients that don’t make sense given the formulation, as well as ingredients that are included at suboptimal dosages. Pulse, on the other hand, contains fewer ingredients, but all are chosen for good reason and included at clinically effective levels. Thus, it’s likely to deliver more bottom-line benefits and results. Do You Want Science-Backed Ingredients and Dosages? What Does Science Have to Say About Pre JYM? What Does Science Have to Say About Pulse? Do You Want 100% Natural Ingredients? These days everybody says their products are “backed by science,” but what does that mean, really? For a product to fully have science on its side, every ingredient must be proven effective in well-designed, well-executed, and peer-reviewed scientific research, and every dosage of every ingredient must conform to the dosages used in these studies (“clinically effective dosages”). If a product doesn’t meet these simple criteria–if the majority of its ingredients haven’t been proven effective in sound research and most of the dosages are below the clinically effective levels–then it’s not “backed by science,” and probably not worth buying. Both Pre JYM and Pulse claim to have scientifically validated formulations, so let’s see how they compare in this regard. Creatine hydrochloride (HCl) is creatine bound with hydrochloric acid, and it’s often claimed to be better absorbed and even more potent than the more commonly used form, creatine monohydrate. Unfortunately, these assumptions have never been proven in scientific research, and don’t make much sense, either. Once creatine hits the stomach, which contains plenty of hydrochloric acid, the creatine and hydrochloride molecules separate, leaving you with the same result as with creatine monohydrate–free creatine. Now, the clinically effective dosage of creatine is 5 grams per day, and if you want to see benefits as quickly as possible, you can “load” it by taking 20 grams per day for the first 5 to 7 days, and then continuing with 5 grams per day. Therefore, the 2 grams of creatine hydrochloride in a serving of Pre JYM is a suboptimal dose. It may slightly improve your strength and muscle gain, but you’d see better results with the clinically effective dosage of 5 grams. Beta-alanine is an amino acid that reduces fatigue associated with exercise and improves anaerobic workout capacity, which can lead to an increase in lean mass. It accomplishes all this primarily by reducing the buildup of lactic acid in muscles during exercise. The clinically effective dosage of beta-alanine is 2 to 4.8 grams per day, and when you look at the data, 4.8 grams is slightly more effective than 2 grams but there isn’t too much of a difference when the supplement is taken every day. Therefore, the 2 grams of beta-alanine in a serving of Pre JYM is at the low end of clinical effectiveness, but still enough to provide benefits. Betaine is another amino acid that boosts strength and muscle endurance. How it does this isn’t fully understood yet, but the most popular theory relates to “cellular swelling” effects, which protects cells from exercise-induced damage and improves performance. The clinically effective dosage of betaine is 2.5 to 6 grams per day. Therefore, the 1.5 grams of betaine in a serving of Pre JYM is a suboptimal dose because it’s well below what has been shown to benefit physical performance. Taurine is an amino acid found in food, and particularly in meat, that plays a vital role in cardiovascular and muscle function. Research shows that supplementing with 1 gram of taurine can decrease muscle damage and oxidative stress from exercise without interfering with the body’s natural inflammatory response. Therefore, the 1 gram of taurine in a serving of Pre JYM is at the clinically effective level. N-acetyl L-cysteine (NAC) is a form of the amino acid cysteine, and it has been used in conventional medicine for more than 30 years. It’s primarily used as a mucolytic (mucus thinner) and to increase levels of glutathione. Glutathione is an antioxidant produced by the body that helps prevent cell damage and limits the accumulation of heavy metals and toxic minerals in the body. NAC has also been shown to reduce the decline in physical performance seen with repeated strenuous training, although it’s worth noting that the study demonstrating this used a dose of 50 mg/kg, which is about 4 grams for an average adult male. Clinically effective dosages of N-acetyl L-cysteine typically range from 200 to 2,400 mg, with lower dosages being used for supporting glutathione and higher dosages being used for cognitive disorders and attenuating fatigue. Therefore, the 600 milligrams of N-acetyl L-cysteine in a serving of Pre JYM is adequate to support glutathione synthesis, but likely too small to impact your exercise performance. Alpha-GPC (Alpha-glycerophosphocholine) is a natural compound that can increase power output in athletes and help mitigate cognitive decline in the elderly. It works primarily by increasing choline levels in the brain, which is a nutrient that turns into acetylcholine, an important neurotransmitter for learning and muscle contraction. In terms of dosages, the research demonstrating increased power output used 600 mg of Alpha-GPC. It’s also worth noting these effects were seen in just this one study; Alpha-GPC is still largely unproven as a performance enhancer. While a daily dose of 1,200 mg seems to help delay the onset of Alzheimer’s, the cognitive-enhancing effects of Alpha-GPC haven’t been tested in young people. It’s also unclear if smaller doses would have cognitive benefits in healthy people. Therefore, the 150 mg of Alpha-GPC in a serving of Pre JYM is well below the clinically effective level. No studies have shown this dosage to provide any cognitive or performance benefits. L-citrulline is an amino acid that boosts muscle endurance, minimizes muscle soreness, and enhances aerobic performance by increasing your body’s production of nitric oxide. It does this by increasing the amount of the amino acid arginine in the blood, and it does so far more reliably than supplementing with L-arginine itself (weird, I know). Malic acid is added to L-citrulline to create L-citrulline DL-malate, which reduces the amount of L-citrulline that’s broken down in the body into other compounds. The clinically effective dosage of L-citrulline for improving performance is 6 to 8 grams per day. Therefore, the 6 grams of citrulline malate in a serving of Pre JYM is at the low end of the clinically effective range, but is enough to improve performance. Beet root is rich in nitrates, which play an important role in cardiovascular health and are converted into nitric oxide through various pathways in the body. Because of its ability to replenish nitrates and thus increase nitric oxide production, beet root is purported to improve physical performance. The science, however, is a bit of a mixed bag. Some studies have indeed shown small performance improvements in running and biking time trials, and other research has shown that dietary nitrate can reduce the amount of oxygen your body uses during exercise without affecting performance (theoretically making it easier to maintain the same pace). On the other hand, another study found that beet root didn’t increase power output, so the weight of the evidence hasn’t swung to favor either side just yet. Beet root dosing is usually based on its nitrate content, but a common dose of beet root juice in studies is around 500 milliliters. Beet root extracts can be used, but dosing would depend on nitrate content, and this can vary from one extract to another. Therefore, as we don’t know its nitrate content, the 500 milligrams of beet root extract in a serving of Pre JYM may or may not improve endurance, and there’s little evidence it will improve strength. Leucine is the star of the trio, as it directly stimulates protein synthesis by activating an enzyme responsible for cell growth known as the mammalian target of rapamycin, or mTOR. Many people claim that BCAAs reduce fatigue and increase muscle growth, but much of the research used to support such claims was done with people who didn’t eat enough protein. Now, while raising plasma (blood) BCAA levels before and after exercise should help us build more muscle over time, there’s no evidence that a BCAA supplement is superior to food in this regard. In fact, some research indicates food is the better choice here (and that’s saying nothing of the fact that it’s also cheaper, tastier, and more filling). Furthermore, adequate daily intake of BCAAs is always important for muscle gain, but you can get more than enough from eating a high-protein diet. Again, no need for the supplement. That said, BCAAs can be a useful supplement when it comes to fasted training. When you exercise on an empty stomach, muscle breakdown rates are higher than normal, and over time this can impair your ability to build muscle. You can counteract this by taking BCAAs before training because the leucine suppresses muscle breakdown rates (that said, I prefer HMB for this). To significantly reduce muscle breakdown rates, you need 3 to 5 grams of leucine, or 10 grams of a BCAA supplement with 2 grams of leucine to every 1 gram of isoleucine and valine. Therefore, the 6 grams of BCAAs in a serving of Pre JYM won’t boost performance or muscle growth, but will reduce muscle breakdown rates if you’re training in a fasted state. L-tyrosine is an amino acid that can reduce stress and improve mood and cognitive function, but doesn’t improve exercise performance. Despite the fact that the body uses L-tyrosine to create the powerful neurotransmitters epinephrine, norepinephrine, and dopamine, supplementing with it only seems to improve mood and cognition during times of extreme stress such as prolonged cold or altitude exposure. It has never been proven to improve strength, focus, or mood under normal conditions. Now, you could say that even if a tough workout isn’t the physiological equivalent of subjecting yourself to 5 hours of oxygen deprivation and freezing temperatures, it could theoretically deplete your tyrosine levels to some degree. If you want to make that argument, then the clinically effective dosage for counteracting the negative effects associated with tyrosine depletion is 100 milligrams per kilogram (or 7 grams for a 150 pound man) or 10 grams per day. Therefore, the 1.5 grams of L-tyrosine in a serving of Pre JYM is far below the clinically effective amount, and won’t produce any noticeable improvement in mood or cognition. Caffeine is a stimulant that increases resistance to fatigue, boosts strength and power, and improves cognition and alertness. Research shows that the clinically effective dosage of caffeine for improving physical performance is 3 to 6 milligrams per kilogram of body weight, which is about 200 to 400 milligrams for a 150-pound man. Therefore, the 300 milligrams of caffeine in a serving of Pre JYM is enough to increase performance for most people. Huperzine A is a compound that inhibits the breakdown of acetylcholine, a neurotransmitter involved in learning and muscular contraction. It accomplishes this by blocking an enzyme (acetylcholinesterase) that breaks down acetylcholine. By preventing the breakdown of acetylcholine, Huperzine A is theoretically able to cause a relative increase of this neurotransmitter in the brain. Indeed, studies in both young people and the elderly suggest that Huperzine A can do this, so theoretically, it could improve learning and cognitive performance (research hasn’t confirmed this yet). There’s something else you need to know about Huperzine A. After taking it, blood levels rise rapidly and peak after about 60 minutes, but the half-life (the time it takes for half of it to be removed from the body) is 12 hours. In other words, Huperzine A remains in your body for a long time, and if you take it every day, you would essentially never stop blocking activity of the acetylcholinesterase enzyme. While this may be helpful for treating certain medical conditions like Alzheimer’s, this wouldn’t be ideal for otherwise-healthy people. In fact, the body may simply adapt by creating more acetylcholinesterase to restore homeostasis, and if it did, your acetylcholine levels would crater once you stopped taking Huperzine A, which is the opposite of what you wanted in the first place. Now, in terms of dosing, dosages ranging from 200 mcg at the lowest to 800 mcg at the highest have been shown to increase acetylcholine levels, with 400 mcg being a reasonable middle ground between the two. Therefore, the 50 mcg of Huperzine A in a serving of Pre JYM is far below the clinically effective level. Perhaps this was intentional to reduce the risk of “fallout” after you stop taking it, but regardless, it’s a suboptimal dose that won’t likely provide much benefit. Black pepper is a spice that naturally contains piperine, a molecule that prevents certain enzymes from breaking down various substances in the body. This, in turn, can increase the bioavailability of certain supplements that would normally be disposed of before being absorbed by the body, like curcumin. Most supplements have a chemical structure that allows them to be absorbed without the help of piperine, however, and that’s the case with every ingredient in Pre JYM. In other words, nothing in Pre JYM will be enhanced by the inclusion of black pepper extract and it doesn’t enhance performance, so there’s really no reason for it to be here. In fact, including it could actually cause problems if you’re taking any other supplements or medications, because it can cause levels to rise beyond what’s safe. Therefore, black pepper extract doesn’t improve the bioavailability of anything in Pre JYM, so its inclusion seems unnecessary. Therefore, the 350 milligrams of caffeine in a serving of Pulse is going to be effective for most people. Malic acid is added to L-citrulline to create L-citrulline DL-malate, which reduces the amount of L-citrulline that’s broken down in the body into other, less beneficial compounds. Therefore, the 8 grams of L-citrulline in a serving of Pulse is more than enough to increase your physical performance. The clinically effective dosage of beta-alanine is 2 to 4.8 grams per day. When you look at the data, 4.8 grams is slightly more effective than 2 grams but there isn’t too much of a difference when the supplement is taken every day. Therefore, the 4.8 grams of beta-alanine in a serving of Pulse is at the top of the clinically effective range, which means it will maximally benefits your performance and body composition. Most studies have shown 2.5 grams is sufficient for the exercise-related benefits, and the only study that used 6 grams was on obese people who didn’t lift weights, so we can’t be too sure as to how those findings translate to experienced weightlifters. Therefore, the 2.5 grams of betaine in a serving of Pulse is enough to produce a noticeable boost in strength and muscle endurance. L-ornithine is an amino acid that appears to reduce fatigue during long workouts by reducing the buildup of ammonia in your muscles during exercise. The exact mechanisms by which it accomplishes this aren’t clear, but it appears that excess ammonia reduces performance. If that’s the case, then taking L-ornithine should allow you to train longer before getting tired. We decided to include it in Pulse for two reasons: there’s enough evidence to suggest it could improve performance, and it’s completely safe and relatively inexpensive, so I liked the odds. The clinically effective dosage of L-ornithine depends on how quickly you want to reduce ammonia levels. If you’re willing to wait a month to see results, then you only need to take 400 milligrams per day, but to reduce ammonia levels in a matter of hours, you need a higher dose of around 8 to 14 grams. Therefore, the 2.2 grams of L-ornithine in a serving of Pulse is enough to enhance performance within a week of use. L-theanine is an amino acid that reduces stress and increases focus, alertness, and mood by increasing the production of calming neurotransmitters. L-theanine can reduce feelings of stress and improve focus by itself, but its main benefit is taking the “edge” off of caffeine. In other words, taking L-theanine with caffeine helps you reap the benefits of caffeine without feeling overstimulated. The clinically effective dosage of L-theanine is 100 to 200 milligrams per day, and for studying purposes, it’s typically included in supplements at about twice the amount of caffeine (100 to 200 mg of L-theanine to 50 to 100 mg of caffeine). 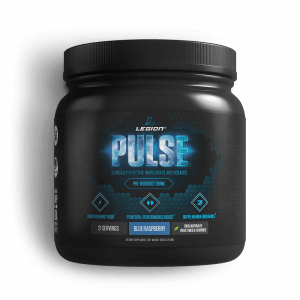 Considering Pulse is a pre-workout, though, we decided to include L-theanine and caffeine in equal amounts. Therefore, the 350 milligrams of L-theanine in a serving of Pulse is enough to improve focus, mood, and alertness, and reduce the risk of overstimulation from the caffeine. Pre JYM contains several high-quality ingredients, like caffeine, creatine, beta-alanine, betaine, and citrulline malate, but some of the dosages are lower than they should be. Out of its 13 ingredients, 6 are at clinically effective levels and 7 aren’t, including several key ingredients like creatine, beta-alanine, and betaine, which significantly detracts from Pre JYM’s overall value proposition. Furthermore, several of the ingredients in Pre JYM are unlikely to provide any noticeable benefit and thus are unnecessary. Pulse, on the other hand, contains fewer ingredients, but all are scientifically validated and included at dosages proven effective in scientific research. It also contains two ingredients that you won’t find in in Pre JYM–theanine and ornithine–which I believe contribute significantly (theanine) and mildly (ornithine) to the overall effectiveness of the product. Caffeine and theanine is just so much nicer than caffeine alone, and while ornithine isn’t the strongest performance enhancing ingredient in Pulse, it does have good evidence behind it and is properly dosed. When it comes to choosing a pre-workout supplement, sometimes what isn’t in the product is just as important as what is. In this case, like most pre-workouts, Pre JYM is artificially sweetened, flavored, and colored whereas Pulse contains no artificial chemicals (it’s naturally sweetened, flavored, and colored). Artificial sweeteners are manmade chemicals that taste like sugar but contain little to no calories. Two of the most popular artificial sweeteners are sucralose (often referred to as Splenda) and acesulfame potassium (Ace K), both of which are found in Pre JYM. While artificial sweeteners may not be as dangerous as some people claim, studies suggest that regular consumption of these chemicals may be more harmful to our health than is generally recognized. As far as coloring goes, Pre JYM contains the artificial dyes FD&C Red 40, Blue 1, and Yellow 5 (depending on the flavor), whereas Pulse derives its coloring from fruit extracts. Like artificial sweeteners, chemical food dyes aren’t as harmful as alarmists would have you believe, but there is evidence that they too may not be as safe for regular consumption as we once thought. That said, some people do prefer the taste of artificial sweeteners over natural ones, so if that’s you, then you may prefer Pre JYM. If you want to minimize your exposure to potentially harmful chemicals, then go with Pulse. 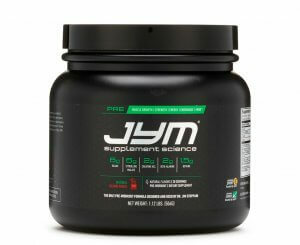 If you’re not concerned about artificial sweeteners and food dyes, though, then Pre JYM is another fine option. As far as pre-workouts go, you can do a lot worse than Pre JYM. It contains several ingredients backed by good science, and it will likely help you perform better in your workouts and feel more alert. That said, some of its ingredients are at clinically effective levels and some aren’t, and it also contains several ingredients that won’t likely do much of anything for your workouts, like BCAAs, Alpha-GPC (at the dosage provided), and black pepper extract. Pulse contains fewer ingredients but all have been proven effective in peer-reviewed scientific research, and all are dosed in accordance with these scientific studies. All that is why it’s the #1-ranked pre-workout on Labdoor, and why it has over 3,100 reviews from customers on Amazon.com with a 4.5-star average, and another 600+ here on my website, also with a 4.5-star average. So in the end, the choice is yours. If you’re not worried about artificial chemicals and feel particularly drawn to Pre JYM for whatever reason, then it may be the better choice for you. If you want a 100% natural pre-workout supplement with scientifically proven ingredients and dosages and nothing else, however, then Pulse is right for you. What’s your take on Pulse vs. Pre JYM? Have anything else to share? Let me know in the comments below!